The Old Maid's Puzzle quilt block is another of the blocks that are often used to teach the beginner quilter. It contains only the square and half square triangle patches. 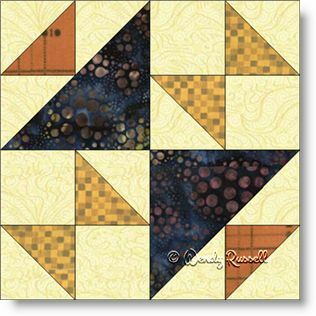 Colour arrangement and block layout can have a big impact on how this block looks when a whole quilt is designed using this block. You might also note that this quilt block looks suspiciously just like the Fox and Geese quilt block. Perhaps it is one of those cases where the same quilt block goes by many names. By using the quilt blocks in groups of four, and rotating the blocks within those groups of four, you create a new, larger quilt block. Several different variations of this four block grouping can be achieved. Following that process, I have created two very different quilt layouts. One takes the four block group and separates with sashing. The second illustration shows the quilt blocks on point, with the setting triangles in different colourations. The different border pairs enhance this "dark and light" quilt.